The Discoverie of Witchcraft, by Reginald Scot (1584). A controversial book published in the reign of Elizabeth I as a counterblast to those who believe in witchcraft. 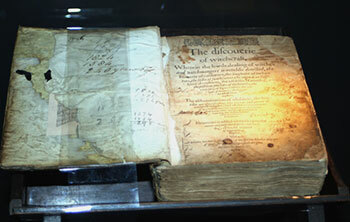 The Discoverie is divided into 16 books (or chapters). It begins with a description of the impeachment and trial of witches and the practice of witchcraft. This is followed by an examination of the ideology and theology of “witchmongers”. The main argument takes place in this first part, and the rest of the work is spent enumerating examples and absurdities. The author advises certain readers to skip book 4 because of its filthy and bawdy content. The middle part covers various magical words – kazam, abracadabra etc. – and a litany of charms and magical cures. Book 13 describes natural magic, with many references to Greek philosophy. A large section is then devoted to alchemy, astrology and conjuring tricks. The work ends with an epilogue that resumes Scot’s criticism of the belief in witchcraft. he that attributeth to a witch, such divine power, as dulie and onelie appertaineth unto GOD (which all witchmongers doo) is in hart a blasphemer, an idolater, and full of grosse impietie, although he neither go nor send to hir for assistance. The justification for witch trials was taken from Exodus 22:18: “Thou shalt not suffer a witch to live“. Scot accepts this authority, but essentially contradicts himself by dismissing the possibility of witchcraft. It’s not an original position, since the church itself prior to 1320 had discouraged witch trials and tended to regard believers in witchcraft as infidels. any Wytchecrafte Enchauntement Charme or Sorcerie, wherby any pson shall happen to bee wasted consumed or lamed in his or her Bodye or Member, or wherby any Goodes or Cattles of any pson shalbee destroyed wasted or impayred … to tell or declare in what Place any Treasure of Golde or Sylver shoulde or might bee founde or had in the Earthe or other secret Places, or where Goodes or Thinges lost or stollen should bee founde or becume, or shall use or practise anye Sorcerye Enchantement Charme or Witchcrafte, to thintent to provoke any pson to unlaufull love, or to hurte or destroye any pson in his or her Body, Member or Goodes. Mostly trivial stuff, but also some substance to explain away the random disasters of high politics and economic collapse. In either case, all designed to capture the gullible. Scot does accept the miraculous deeds of Moses, who differs “as much from a magician, as truth from falshood, and pietie from vanitie” (bk.15, c.31). But he laces his biblical references with scepticism, especially in the case of the Witch of Endor (or Pythonissa), who appears in 1 Sam. 28*, where she is described as raising Samuel from the dead. Scot dismisses this through biblical exegesis, showing that it was merely an illusion (or cousenage – his favourite word, meaning deception or trickery). This leads Scot to his main point, that the age of miracles ended with the mission of the apostles. Scot relies on Saint Augustine and especially on the protestant divine, Jean Calvin: “The grace of healing (saieth he) spoken of by S. James, is vanished awaie, as also the other miracles, which the Lord would have shewed onelie for a time, that he might make the new preaching of the gospell mervellous for ever” (bk.8, c.1). It follows that the gift of prophecy is dead, that oracles are ceased, that soothsayers, nativity casters, and dream diviners are charlatans: “for God is the onlie searcher of the heart, and delivereth not his counsell to such lewd reprobates” – the lewdest were Papist priests emulating the augurs of ancient Rome, whose “observations were so infinite and ridiculous, that there flew not a sparkle out of the fier, but it betokened somewhat” (bk.11, c.14). Scot concludes that if the word of God were preached then such illusions of spirits and devils would disappear. But he goes further by admitting that the reason contained in the works of astronomers, physicians and philosophers is acceptable. Another subject of The Discoverie is the rules of evidence at witch trials. Scot seems to have had direct experience of these events, although he doesn’t make clear whether these rules were applied in England. In any event his description raises complex issues in the field of forensic examination. Scot cites Bodin’s premise that in an extraordinary matter there must be extraordinary dealing, “and all manner of waies are to be used, direct and indirect” (bk.1, c.3). To this end the rules of evidence must be adapted by the witchmongers so that the accused is overwhelmed with testimony that admits no challenge, eg. anonymous accusers, uncorroborated testimony, inability to challenge the testimony of children and people of bad character (including perjurers) and known enemies, confessions inveigled by fellow prisoners, false assertions that a co-accused has already confessed, the inability to retract a confession, examination under threat of torture, and confessions extracted by torture. Even the Old Testament requirement that two witnesses are required to convict on a capital charge is dispensed with. It’s the Renaissance version of Guantanamo. Perhaps even more frustrating is the notion that presumptions cannot be rebutted and are sufficient as proof: should an old woman threaten a healthy person, who dies thereafter or is infected with a strange disease, that is proof sufficient for condemnation. Errors in a confession are imputed to malice. Marks in the armpits, under the hair, under the lip, on the buttock, or in the “privities” are enough to ground the sentence of death. Ultimately, according to Scot, “rumors and reports are sufficient (saith Bodin) to condemne a witch” (bk.1, c.5). Scot goes on to describe the process of torture and trial. At the place of torture hallowed items marked with the seven words spoken on the cross are hung about the accused’s neck, “and the length of Christ in waxe be knit about hir bare naked bodie, with relikews of saints” (bk.1, c.8). She is shaved all over and racked, and is then made to drink holy water. After the accusations have been read out she is confronted by the witnesses and offered trial by carrying a burning iron in her hand. At the full trial the accused must be arraigned before the court backward – “with her taile to the judges face” – and the judge must cross himself many times as she approaches the bar. The judge wears about his neck conjured salt, palm, herbs and hallowed wax. It is impossible to gauge the reliability of Scot’s account of such proceedings, and whether he based it on experience or on his reading of authors like Bodin. His sympathy with the accused does ring true, and he refers to Christ’s forgiveness of the apostasy of St Peter to demonstrate how unreliable people are when in fear of their lives and how compassion should be shown for that failing. But the witchmongers counter that the witch’s sin is the sin against the Holy Ghost, which is irremissible. So the theological conundrum keeps revolving. They are so troubled with evill humors, that out go their venomous exhalations, ingendred thorough their ilfavoured diet, and increased by meanes of their pernicious excrements, which they expell. Women are also (saith he) monethlie filled full of superfluous humors, and with them the melancholike bloud boileth: whereof spring vapors, and are carried up, and conveied through the nosethrels and mouth etc; to the bewitching of whatsoever it meeteth. For they belch up a certeine breath, wherewith they bewitch whomsoever they list. And of all other women, leane, hollow eied, old, beetlebrowed women (saith he) are the most infectious. Decollation of John Baptist, performed in 1582. The later books of The Discoverie are of great interest to magicians because they provide an early and comprehensive account of some of the most common tricks. To eate a knife, and to fetch it out of anie other place. To thrust a bodkin into your head without hurt. To thrust a peece of lead into one eie, and to drive it about (with a sticke) betweene the skin and flesh of the forehead, untill it be brought to the other eie, and there thrust out. To cut off ones head, and to laie it in a platter &c: which the jugglers call the decollation of John Baptist. The final oddity is Scot’s tale (bk.12 c.14) of a lady who paid for a charm to be hung about her neck to cure sore eyes – her health was restored, but she lost the charm and the soreness returned. The charm was discovered, and when the scroll was unwrapped it contained these words: “The divell pull out both thine eies, And etish in the holes likewiise“. Charming wordplay! Scot’s humaneness cannot be faulted, but his tone is mostly scolding and entirely lacking in charm or humour, and this makes The Discoverie quite a difficult, albeit fascinating, read. On almost every page the reader is reminded of the author’s searing outrage at the cruelty and fervour of the witchmongers, of his contempt for the gullibility of the common people, and it becomes a bit wearing. The Discoverie was intended to be controversial, and it did attract a lot of attention. Shakespeare used it as a source in some of his work, but it most famously drew condemnation from King James I, who wrote in The Daemonologie that Scot, “mainteines the old error of the Sadduccees, in denying of spirits“. Isn’t this the dilemma of all transcendental religion: how to engage with the World without drawing the charge of atheism? *Scot mistakenly cited 2 Sam. 28 (bk.7 c.8).